Russian mathematician; born in 1840 at Erswilken, near Tauroggen, a small town in Lithuania; died at Cologne May 8, 1898, Educated for the rabbinate, he had been appointed to a rabbinical position at the age of twenty-four, when he decided to devote the rest of his life to the cultivation of the secular sciences. He went, accordingly, first to Odessa and later (1868) to Berlin, where he studied for three years in the Gewerbeakademie. Returning to Odessa, he became a merchant, but in 1878 he again took up his scientific studies, and for the next four years busied himself at Heidelberg, especially with mathematics and physics. In 1883, after obtaining the degree of Ph.D., he established himself as privat-docent in mathematics at the University of Heidelberg, becoming assistant professor in 1887. 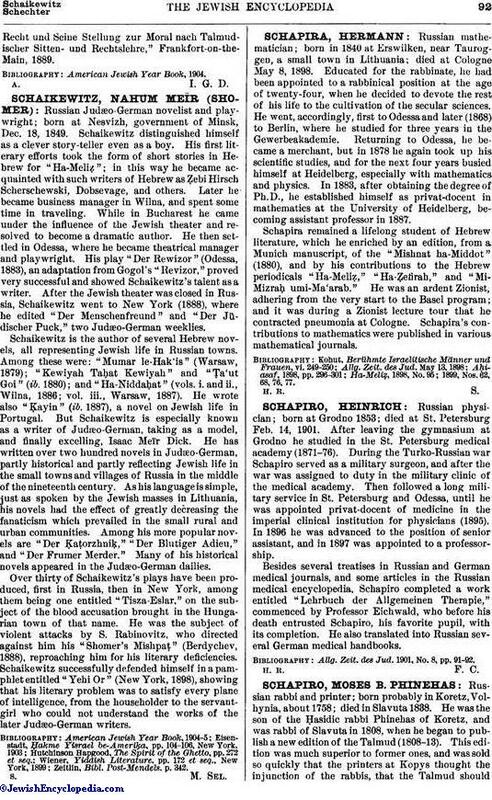 Schapira remained a lifelong student of Hebrew literature, which he enriched by an edition, from a Munich manuscript, of the "Mishnat ha-Middot" (1880), and by his contributions to the Hebrew periodicals "Ha-Meliẓ," "Ha-Ẓefirah," and "Mi-Mizraḥ umi-Ma'arab." He was an ardent Zionist, adhering from the very start to the Basel program; and it was during a Zionist lecture tour that he contracted pneumonia at Cologne. Schapira's contributions to mathematics were published in various mathematical journals. Ha-Meliẓ, 1898, No. 95; 1899, Nos. 62, 68, 76, 77.